Are we really surprised? A filmmaker who has a track record of luring us into a movie with a great premise, keeping our attention for a while, then whacking us on the head with a foam hammer, made yet another film that is unnecessarily bad. 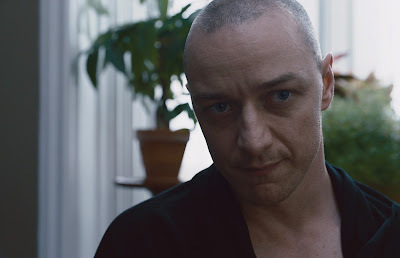 For what it's worth, SPLIT starts off as an engrossing thriller that places James McAvoy at the center as a man with disassociate personality disorder (24 of them, to be exact) who has an affinity toward abducting teenage girls. That in itself is creepy enough to build a whole narrative around. Trouble is, M. Night Shyalaman, as perennially over zealous as he is, doesn't stop there. Adding to the already stuffed premise are the gratuitous subplots -- child molestation, cutting, carnivorous beasts-- all of which take away from what could have been an interesting psychological thriller (albeit, generic) that delved into the mind of a predator. Sure, McAvoy is a dream to watch, and his performance is a reminder of his enormous talent. But Shyalaman decides to also give one of his three most recent abductees, Casey (Anya Taylor-Joy), a backstory -- told intermittently in flashbacks -- that neither enhances the plot nor ultimately makes any sense. Then, one of McAvoy's alter egos turns into a literal beast (and sadly not in the X-Men kind of way). Shyalaman just continues to throw in everything but the kitchen sink, to the point that all you can do is roll your eyes and shake your head by the end of the film. And it didn't even have to go down that way. SPLIT could have been a decent movie (for Shyalaman standards anyway). It's shot well. Its ominous setting, nestled deep in the pit of a dark, multi-layered, multi-doored complex puts you on edge. But the narrative -- LORD, this narrative -- becomes a steaming hot mess. It's clear that not even Shyalaman knows what he wants to achieve with all these competing narratives. The film becomes completely muddled, and ends in a way that is supposed to be clever but by then I was so frustrated by everything I'd just watched that I didn't even care about it. That's that Shyalaman effect that we know all too well. Le sigh. The reviews for this movie are all over the place. My friend saw it today and loved it. I'll probably watch eventually, but my expectations are low. I think I trust your opinion over his lol.